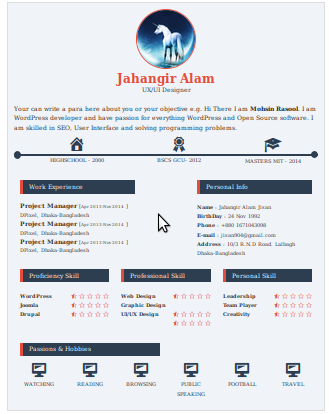 A dedicated WordPress theme to have your quick CV/Resume up and ready on your unused that personal domain! 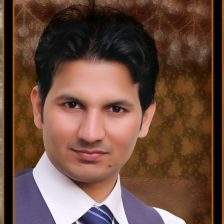 Very special thanks to My friend and talented Designer, : Jahangir Alam Jisan . He was very kind to allow me to use his free design (PSD) to create this theme. I will add more information and ideas and usage examples here as this theme gets history. Ideas and feature requests are welcome. I will make sure it is just does one thing and does it great. Let’s have the first version 1.0 out soon. I will update with link here when it is ready. I am glad to update that v1.0 is out! I know it is bare bones and it can be improved. I will add more features which are essential to the usability of the theme. For now I would like to add sample html texts you can use in different widget areas to populate your own CV sections in the homepage using MyResume theme.